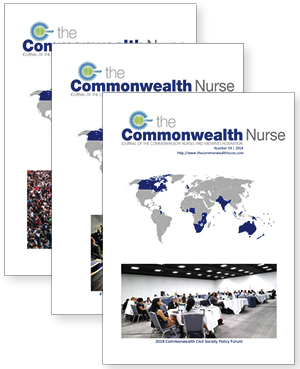 The Commonwealth Nurses and Midwives Federation congratulates the Head of the Commonwealth, Her Majesty Queen Elizabeth II, as she celebrates her Diamond Jubilee. Her Majesty is much loved by the people of the Commonwealth and across the world for her dedication and selfless service for the past 60 years and we wish her many more years of good health. I have always admired Her Majesty from a distance and on Commonwealth Day this year, I had the great privilege of seeing her close-up, not once, but twice in one day. It was like a dream come true! Leadership was the opening and closing themes of the conference. Dr Peter Carter in his opening address titled: Leadership in nursing, discussed the difference between leaders and managers stressing the need for nurses and midwives to be leaders first and managers second. Honourable Ministers of Health: I am addressing you today on behalf of the Commonwealth Health Professions Alliance and the broader Commonwealth civil society family.